This morning I was going through a lot of the old workouts I did after my son was born. I was searching for something I have not done for a long time and would challenge me. 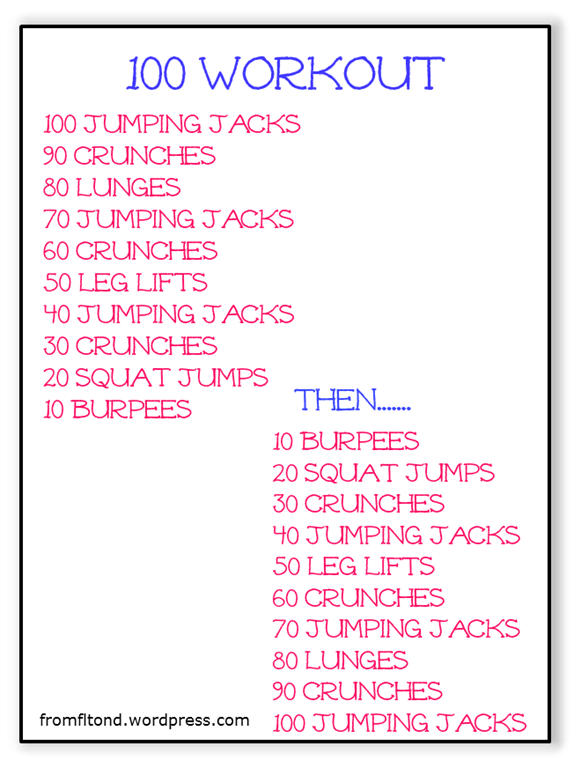 Well, I came across my 100 Workout! After doing this workout I think I have an idea as to why I hid it to begin with…it is hard. Here is how it works: Do each exercise back to back with no breaks. Then, take a 1 minute break after you finish the first circuit (after the 10 burpees). After you take your 1 minute break go right back into it starting at 10 burpees and going back up to 100. Your goal is to keep a good steady pace through the whole thing and try not to slow down. To show off, my husband did this whole thing and then went through and did it again, so if you are in good shape and need even more of a challenge feel free to do both circuits twice!!! This entry was posted in Uncategorized, Workouts and tagged at home workout, circuit, circuits, fitness, leg circuit, leg workout, toning, workout on September 29, 2012 by fromfltond.